Please note that all set times below are the information we have at this time and are subject to change. We strongly suggest that guests arrive early enough to go through the entry search at the front gates and to be shown to your seats in time to see your favorite performer. Please allow at least 30 minutes prior to the stated set time below. Stay Tuned for 2019 Announcements! Make your night even more memorable by purchasing an exclusive upgrade! 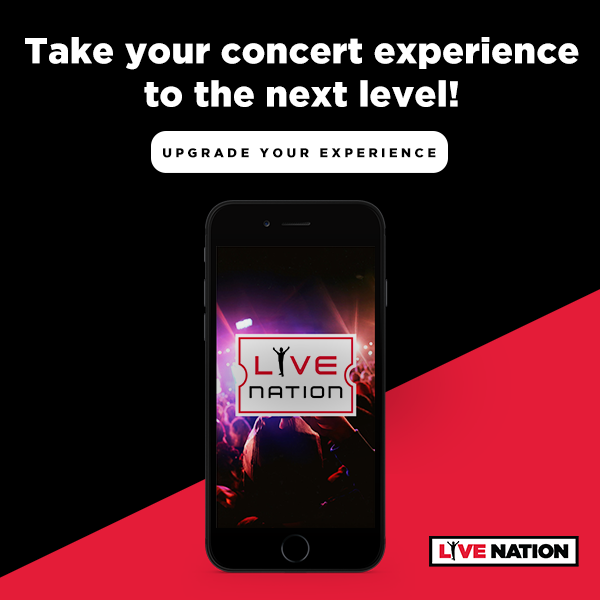 Download the Live Nation App to purchase Premier Parking, seat upgrades, and access to The VIP Club! Upgrades are 100% mobile! a valid Out-of-State Driver’s License which has the patron’s photo and indicates that the patron is at least 25 years of age or older and subject to the conditions that (1) the patron must actually appear to be 25 years of age or older and (2) if the patron is between 25 and 30 years of age, the patron must also produce another form of identification (such as a credit card, with a signature to compare signatures), which substantiates the person's identity. a valid Canadian Driver’s License/US Territory License which has the patron’s photo and indicates that the patron is at least 25 years of age or older and subject to the conditions that (1) the patron must actually appear to be 25 years of age or older and (2) if the patron is between 25 and 30 years of age, the patron must also produce another form of identification (such as a credit card, with a signature to compare signatures), which substantiates the person's identity. This document must be printed in English. We will not accept: out-of-state issued driver’s license which indicates that the patron is 24 years of age or younger; out-of-state issued identification cards; out-of-state issued liquor identification cards; out of country driver’s license except Canada/US Territory, this document must be printed in English; VISA’s; Alien Registration Cards; Passports from governments that are not officially recognized by the United States; Dependant/Merchant Marine Military Identification Cards; duplicate forms of identification; expired forms of identification; photo copies of any form of identification; non-photo forms of identification of any kind; and damaged, mutilated or altered licenses or other forms of identification. Any patron in the possession of alcoholic beverages on premises may be requested at any time to produce valid identification which must satisfy the foregoing requirements. No refunds will be offered for confiscated alcoholic beverages. Any patron who presents false identification or who passes alcohol to a minor may be subject to eviction and arrest. Any patron who passes alcohol to another patron who is unable to provide an acceptable form of identification as listed above may be subject to eviction. We will not serve more than two alcoholic beverages to a patron at one time and we reserve the right to limit service to one drink per patron. Our alcohol service will end at least one hour prior to the scheduled end of an event. We reserve the right to discontinue the sale of alcohol at any time. We will not serve any patron whom we believe to be intoxicated. Alcoholic beverages may not be taken into or removed from these premises. Any patron in the possession of alcoholic beverages not obtained on premises will be subject to eviction. New England Sportservice retains the right to refuse any ID, and to refuse/cease service to any patron at any time. Our policies are in place for your protection, as well as ours. If any assistance is needed with your vehicle please contact your normal Emergency Assistance provider. Xfinity Center does not have tow or lockout services on site. Emergency assistance vehicles are permitted on property to assist with lockouts, jumps or tows but the guest will need to arrange for such services. •Bags that are clear plastic, vinyl or PVC and do not exceed 12" x 6" x 12." •One-gallon clear plastic freezer bag (Ziploc bag or similar). The box office is located at the main ticket gates and will not be open for the season until October 1. All tickets can be purchased via www.livenation.com or over the phone through Ticketmaster. Busses are considered an oversized vehicle. Busses that will be dropping off guests can leave the parking lot and return 45 minutes prior to the end of the event. All busses will be boarded by our security staff to ensure no underage drinking is taking place on the bus. If there is any underage drinking- the whole bus will be turned around and no one will be able to enter the event. The venue will not issue refunds and bears no expense that will be incurred due to non-admittance. Mansfield Police Department will be on site assisting in the bus lot to ensure all guests on busses are acting appropriately and within accordance of the law. *Subject to change based on event. Xfinity Center does not allow weapons on our property. Guests should follow all applicable laws regarding securing a weapon in a vehicle if they have it on them when they arrive. The venue will not secure weapons and will take no responsibility for any weapons left in vehicles. Xfinity Center offers a wide variety of concession options through the venue. This includes cheeseburgers, hot dogs, nachos, pretzels, candy, popcorn, fountain soda (Pepsi Products), water, and Red Bull. Please let the parking staff know that you are dropping someone off and they will direct you. Guests cannot remain in their vehicles during the event- they must drop off and return 45 minutes prior to the end of the show. If you are not back within 45 minutes of the end of the event- you will not be allowed to enter until the majority of cars have exited the parking lot. Local law enforcement will shut down all incoming traffic and only allow traffic out of the venue. There are a total of one main entrance gate to the facility. Gates are available for use regardless of the ticket type. There is 1 Fast Lane gates. You must have your Fast Lane pass to utilize this gate. The VIP Club has a separate entry gate located to the right of the main gates. All guests using this gate must be VIP clients and have the appropriate ticket. Xfinity Center will do our best to get any fan mail sent to the venue to the appropriate parties. We cannot guarantee that any package or letter will be given to an artist. We recommend visiting the artist's website and sending any items to their designated address. We are not responsible for returning anything that is sent to the venue for an artist. Parking lots will generally open 3 hours prior to our scheduled gate time. Gate times vary, but are usually 4 hours prior to show time. Please check the specific event page as these dates are subject to change. Please do not attempt to enter the venue any earlier than the designated times as you will be turned around and told to return when the parking lots open. Xfinity Center does not offer group ticket sales. 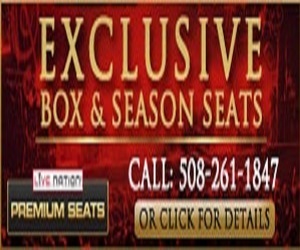 If you have a large party that will be attending the show the only option would be to contact our Premium Seating Department at 508-261-1847. Premium Seating sells all VIP boxes, suites, and clubs at the venue that can accommodate larger parties than the standard ticket limit. Xfinity Center strives to ensure that all of our guests have a great time at our venue. If you need additional assistance while you are here please make sure you let us know. Day of Show Parking- Accessible Parking is located outside the main ticket gates. Let the parking staff know that you need accessible parking and they will direct you to this lot. Please be advised that parking is limited. Please have your placard visable. If you do not absolutely need accessible parking- please park in the general lots. Interpreter Requests- if you will need an interpreter for an event please give us at least 2 weeks notice to secure. Guests that request an interpreter will need to pick up their tickets at will call. When the tickets are picked up we will introduce you to your interpreter for the evening and take you to your seats. There is no charge for interpreter services. Please call 508-339-2331 to arrange for an interpreter for your visit. The lawn is always first come, first serve. Guests may notice a row or seat number on their lawn ticket, but that is only used for tracking purposes. There are no assigned seats on the lawn. First Aid is located near the main ticket gates. We have trained medical personnel that are able to assist with any issue you encounter. We have ambulances on site throughout the duration of the event that can transport guests if needed. If you have medication that you need stored in a refrigerator please go to the first aid area and our medical staff will assist you. If you have a condition that requires you to use a needle for medication while you are here- please do so in our medical office so the syringe can be properly disposed of. Merchandise will be available for all concerts at our Concert Gear booths located on either concourse. For Festival shows- there will be merchandise located throughout the facility and sold by various vendors. All concert gear is property of the artist and the venue has no responsibility related to the craftsmanship or style of any merchandise. Please make sure you check that you have the correct size and there are no defects in the shirt before you walk away from the stand. The venue cannot assist with replacing or refunding any merchandise after the event has ended. Parking at the Xfinity Center is free. To upgrade your parking please purchase a premier parking ticket on ticketmaster.com or day of show if still available. If you are interested in purchasing a floor box, season seats or club access for the season please contact our PSS department at 508-261-1847. Neither the venue receptionists nor the box office can answer questions regarding pricing or availability for these boxes. Premier Parking is available for every event. The price will vary based on event. This can be purchased prior to the show via www.livenation.com or on site at the venue. Premier Parking is located in our lots to the left. Premier Parking does not guarantee early exit out of the parking lot. Xfinity Center participates in a venue wide recycling program. You will find recycling bins located though-out the venue. Please recycle where possible. Re-Entry is not permitted at the Xfinity Center. Please ensure that everything you will need for the event is brought in with you. If you do leave at any point in the evening- you will not be allowed back in without a new ticket. There is no smoking in our reserved seating. We ask all our fans to be respective of those around you. While we do not restrict smoking on the lawn- if guests around you are complaining we will ask you to smoke in the plazas. We appreciate your cooperation. All sponsorship inquiries should be directed to our office- please call 508-339-2331 and ask to speak with someone in sponsorship. Any handouts or presence on site needs to be cleared with venue sponsorship. If you do not have permission to be on site you will be escorted off property. All tailgating activities must be conducted in accordance with town of Mansfield by-laws and Mass General laws. This does not allow the consumption of alcohol on property unless sold by the Xfinity Center. Furthermore it prohibits drinking in public and public intoxication. Please be respectful of other guests. Guests can report any issues to any Xfinity Center staff member. Venue management reserves the right, without the refund of any portion of ticket purchase price, to refuse admission or to eject any person whose conduct is deemed by management to be disorderly, who use vulgar or abusive language, or who fails to comply with the rules of the venue. Are never permitted in the venue. The VIP lots are located at the front of the parking lot. Guests must have a pass or be on the parking list to access these lots. Guests can enter through any road entrance and be directed to these lots. Will call tickets are available for pickup at the box office located at hte main ticket gates. Please make sure that you have a photo ID matching the purchasers name to pick up tickets. Any name changes need to go through Ticketmaster Customer Service- 800-653-8000. Xfinity Center (previously Comcast Center, Tweeter Center for the Performing Arts aka Great Woods) is located at the junction of Routes 140 and 495 South (within minutes of I-95). From Boston: Take I-95 South to exit 7A-140 South, follow for 3 1/2 miles. From Worcester: Take 495 South, to exit 11. From Providence: take I-95 North, to exit 6A-495 South, to exit 11. From Cape Cod: Take 495 North, to exit 10-123, follow 123 West to 140 North. Hours: Box Office Will Open for 2017 Season TBD Mon-Fri: 1:00-5:00pm (non event days) 1 hour to 1 1/2 hours after start of show time on event days. The Xfinity Center facility contains 16 parking lots providing ample parking for all ticket holders with no additional charge. Be assured that every effort is made to ensure a safe and speedy exit from the facility. ALL RECREATIONAL VEHICLES AND BUSSES MUST BE FILLED TO CAPACITY WITH PATRONS HOLDING VALID TICKETS. NO TRAILERS, COMMERCIAL TRUCKS, OR COMMERCIAL CATERING BUSINESSES ARE ALLOWED IN THE PARKING LOTS. Will Call is available at the Box Office 2 hours prior to event. © 2006 - 2014 Live Nation Worldwide, Inc. All rights reserved.